I am sitting on a bench at the LA County Arboretum. A gecko is making his way over to me, checking me out as he pumps his chest up and down. I slightly move my foot and he scampers off. I am sitting in the area above the waterfall, with a small pond filled with lily pads, tadpoles, a few turtles and 2 smaller waterfalls. There is a hibiscus bush in front of me and I can see the San Gabriel Mountains in the distance. 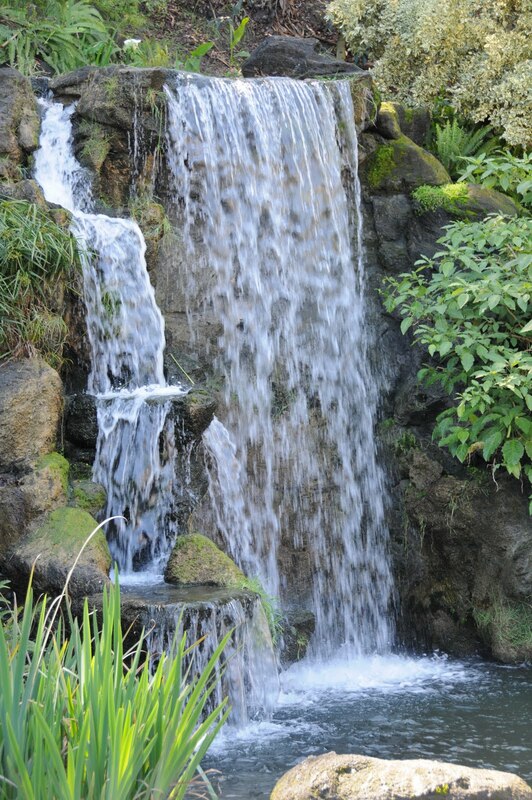 I can hear birds chirping, dogs barking off in the distance, and relaxing sounds of the tiny waterfall before me. There is a wafting floral scent that makes me wish I knew more about flowers. There is a paved pathway that circles around the pond, I know one side leads you down a set of stairs that will take you to the front of the large waterfall and the other direction will lead you off into the numerous trails that encompass the Arboretum. The winds just shifted and a rather unpleasant floral scent has wafted my way. There is a sound approaching me that sounds something like a cat in pain. 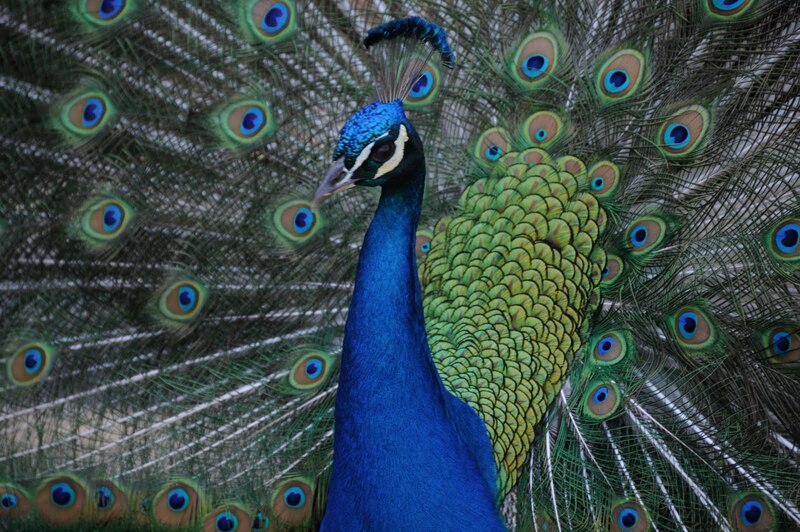 It is simply one of the many peacocks who call the Arboretum home. I guess he doesn’t find me threatening since all of his feathers are down. I think he is wondering whether or not I have anything to feed him. Unfortunately, all I have with me is my purse and netbook—neither being a tasty option. It’s Friday afternoon/early evening and this is my way to unwind after yet another draining week of teaching. 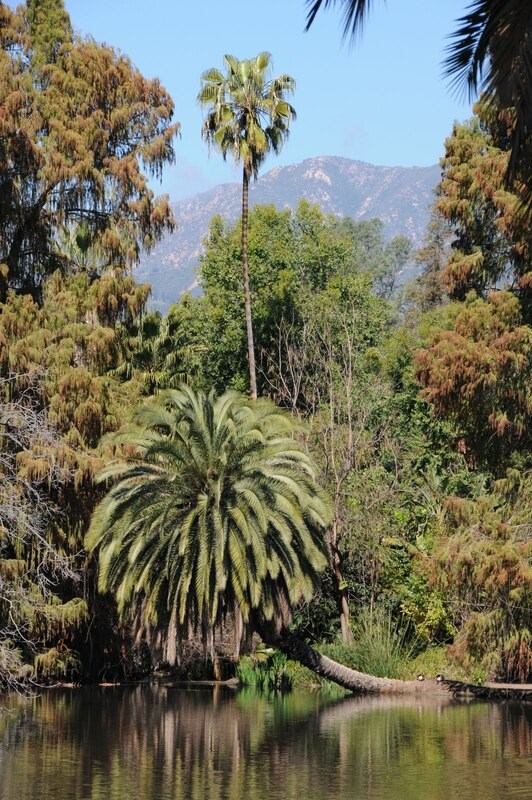 The Arboretum is my refuge, my escape from Los Angeles without leaving Los Angeles. I love to come here just to walk (my goal is to get in 10,000 steps a day) or to do exactly what I am doing now, sitting on a bench with my netbook writing. There are no students here vying for my attention or trying to bribe me for a higher grade. No parents complaining because they think my journal topics are inappropriate for a photography class—yes, that’s right folks, current news stories are inappropriate for a PHOTOJOURNALISM class in the mind of some. They also feel it is inappropriate for a teacher to wear sneakers but unless they want to buy me new shoes and they are willing to pay for me to get a foot massage after the end of each school day, my New Balance, made in the USA, cross training shoes aren’t going anywhere. I’m on my feet all day and I’m not a girly-girl—high heels don’t work for me. Police sirens are now ringing off in the distance, reminding me that I am still in Los Angeles. And as I look at my watch, I am reminded that my time here in my peaceful haven in limited. Here in Los Angeles, you have to pay admission to go and sit in a nice park setting and the park closes at 5pm—thus allowing one to return to the norm of “Los Angeles”—the parking lot we refer to as Rush Hour. A Rush Hour that will ruin my current state of Zen. But alas, this is life in the big city, life in lala-land. You pay to enjoy nature in a confined area but the annoyance of the crowded hustle and bustle of city life is free to enjoy. Thank you city of Angels!! !